Graze is a web-based subscription service that sends customers specially-customized snack boxes via old-fashioned mail. Graze was founded in 2007 in the United Kingdom, but has since made its way into the United States. Snack boxes are comprised of a variety of healthy snack options, which are always non-frozen and non-perishable. Continue reading this Graze review so that you have all the information that you need to decide if you are interested in subscribing to Graze. Getting started with Graze is a fairly simple process, although it will take a bit of time, so we recommend planning to be able to dedicate 10-15 minutes. First you'll be asked to enter your name, address, and credit card information. Once you’ve committed to the subscription, Graze will ask if they have any food allergies, and if you are vegan, vegetarian, or gluten-free. You will also be asked if you have any foods that you absolutely do not like, as well as if you have a microwave or not. The set-up process to get started with Graze goes on to get even more specific. Graze has a hefty set-up process simply because they are committed to getting you the perfect snack variety. In order to make sure you get exactly what you want, you will be asked to "react" to all of the snacks that Graze offers. Ratings include “trash,” “try,” “like,” and “love.” You can also click on each snack to view the ingredients and nutritional information prior to making your rating. Once you have completed the rating process, Graze will send you a message saying, “Amazing, thanks for telling us what you like. We hope you enjoy your first box!” Graze uses these ratings and preferences to customize random snack selections for every box using an algorithm which the company calls DaRWIN. Graze offers a simple snack box option that is priced at $6.99. It includes four random snacks that are chosen based off of your rating. Wholesale orders, which include a total of 20 snacks can be purchased for $25.00. They also offer more specified snack boxes. Almost every snack box that Graze offers is priced at $11.99, and contains eight snacks. Graze also offers one snack box that is priced at $13.99, which contains ten snacks. 8 Snack Variety Box - "Enjoy all the snacks Graze has to offer." Popkern Box - "Get the best of both worlds with our light & airy popcorn and our crunchy half-popped kerns." Sweet Treat Box - "Guilt-free sweet indulgences that are not only delicious but also nutritionist-approved." Savory Box - "Explore just our savory snacks, inspired by tastes from around the world." Top 20 Box - "Experience the Graze fan favorites with a variety of top-rated snacks." Afternoon Pick-Me-Up Box - "Good source of protein and/or fiber, to keep you going through the day." Breakfast Box - "Start your day the Graze way with a variety of our tasty items." Flapjack Box - "Our range of unique rustic rolled-oats flapjacks, handcrafted from a family recipe." Upon joining Graze and beginning your subscription, Graze will send you a snack sampler box for absolutely no charge at all. Customers always have the option to cancel their subscription at any time, so the sampler box will give you an idea of if you want to continue with Graze or not. It will also let you know if you like the food that Graze has to offer. Graze offers healthy snack options that include: Non-genetically modified ingredients, no high fructose corn syrup, no artificial sweeteners, flavors, or coloring, no trans fats, and no hydrogenated oils. Graze caters to vegetarians, vegans, and individuals with gluten allergies. Graze snack boxes are affordable and convenient. Snack boxes are shipped directly to the doorstep of the customer. Graze offers over 100 different snacks. Customers receive random snacks based on their customized tastes and preferences. Graze offers wholesale orders for an office party, for example, as well as gift boxes and gift vouchers. Customers have the option to choose when they want their gift boxes. You can receive a box every week, two weeks, four weeks, or on any given weekday. You can “snooze” or simply post pone your snack boxes if you are going on a trip, for example, as well. The set-up process is very lengthy. Cancellation difficulties – One of the most common negative reviews on Graze is that it is often difficult to cancel the service once users are signed up. Graze is not suggested for people with allergies. Graze only ships to the lower 48 states, and does not ship to Hawaii, Alaska, and/or U.S. Territories. Graze policy states that they do not ship to Army Post Offices (APOs) or Fleet Post Offices (FPOs).Snack boxes cannot be refunded or returned. Packages typically take about ten days to ship, although a handful of customers said that they got their snack boxes a few days earlier than expected. All Graze snack boxes are sent through UPS, and customers do not even have to sign for the boxes when they are delivered. Box dimensions are listed as 9″x6″x1″, which is supposed to fit into most standard mailboxes/P.O. boxes. Boxes will then be left on your doorstep. Graze partners with Offset Print & Packaging to provide a colorful, pre-portioned package that appeals to the customers. Offset Print & Packaging conducted several production trials with Graze, which clearly demonstrates a range of high quality print options. Together, Offset and Graze have developed a new range of quality retail packaging. Graze takes great pride in their packaging. The card is thin, yet strong at the same time. All packaging originates from sustainable forests and is biodegradable and recyclable. I’m having trouble logging in - Help! The first thing that is strongly suggested is to double-check if you have used a different email address to sign up. If this does not fix the problem, the best option is to directly contact Graze via email. There is an easy-to-follow email template, which can be found at graze.com. Does Graze cater for people with allergies? Graze is not suitable to those with allergies. Graze snacks are packed in a facility that processes peanuts, tree nuts, wheat, milk, soybeans (soya) and egg. In addition to this, cross-contamination between any of our ingredients is possible. 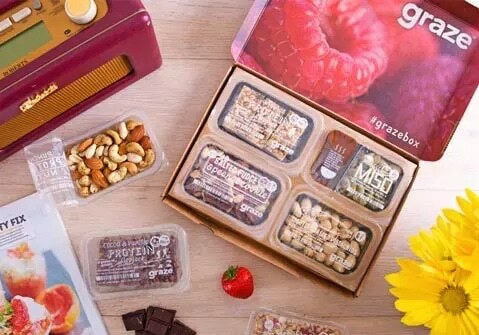 Each snack box is prepared especially for each customer, so Graze is unable to refund snack boxes that are refused or marked as returned to sender. Any boxes that are marked as "return to sender" or "refused" will be disposed of by USPS, and will not be sent back to the graze kitchen. Where can my snacks be delivered? Snacks will be delivered to the doorstep of your home, or the doorstep of your workplace. Graze will ship anywhere in the United States excluding Alaska, Hawaii, and United States territories such as Puerto Rico. How do I cancel my ongoing subscription? Subscriptions can be canceled if you visit your orders page, which you can get to by clicking your name in the top right-hand corner of any page. Now that you have read this Graze review, you are probably trying to figure out if this is the opportunity for you or not. Graze is absolutely worth it for customers who are looking for simple, convenient, and healthy snacks. It is a reliable and affordable service that values its customers. After reading this Graze review, you should now have all the information you need to decide if this is an opportunity that is worth-while for you or not. Ready to give it a try? ​Click here to get your first box free. Graze provides a convenient way for snack enthusiasts to get access to their favorite snacks without having to go to the grocery store. Some items are a bit pricier than comparable items in the store, but when you factor in the convenience of getting the snacks delivered, we think it's worth the price! I love Graze! I’ve been dying to find the perfect snack box subscription that offers healthy, customizable snacks. This is just what I’ve been searching for. Everything was straight forward, no funny business, and the customer service team was ready and willing to assist me when I had a question. Hi Fred! We agree! Graze is a staple subscription snack box for anyone and everyone. Great to hear that you have a stellar recommendation for others. Thanks for commenting! Graze does so much advertising on social media and television, but my experience with this box was best summed up in “meh”. I was really excited while signing up for it, but the box was average in terms of excitement. The website is super well set up. The main disappointment was in the actual snacks. It’s basically a trip to trader joes but a lot less satisfying. Graze is pretty cool. They offer a great little selection of treats. It’s hard to find vegetarian, vegan, and even gluten free snacks that STILL taste good. Their snacks are non-gmo, have no high fructose corn syrup, no artificial sweeteners, flavors, or coloring, no trans fats, and no hydrogenated oils. Now that’s pretty hard to compete with!